This is the title screen you see when you start ShotList on iPhone. To choose a project, tap “Select Project”. To access our support website and the latest version of this manual from this page, tap the “Support” button. Please visit our support page if you have a problem and need help, or if you have a suggestion to make for any future enhancement to ShotList. We are always glad to hear from you. If you like ShotList, please do support its development by rating us on the App Store. If you have a problem, or a request, please contact us directly. Under normal circumstances we respond to all support requests within 24 hours. To spread the word about ShotList by email, tap the “Share” button and personalise your message. Invite others in your team to try ShotList, then you will be able to share your projects with them wirelessly using the free Dropbox service. 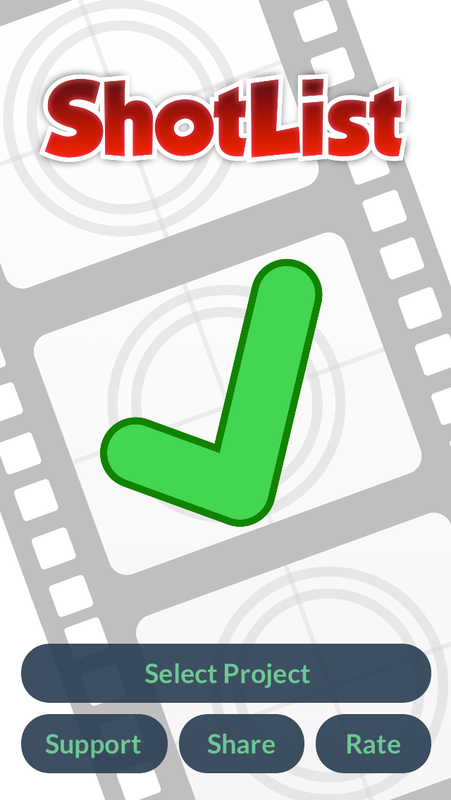 To rate or review ShotList on the App Store, tap the “Rate” button. Of course, if there is anything you are having difficulty with, or would like to see added to ShotList, we would prefer that you let us know directly so that we can help.